The key to management of gum disease (for humans or pets!) is prevention. As long as the surfaces of the teeth are cleaned frequently, the gums will stay healthy. Excellent oral health is maintained by daily oral hygiene. The gold standard is brushing. Daily chewing activities can also be effective in maintaining oral health. Daily use of products that have been awarded the VOHC Seal will help to keep your pet's teeth clean and the gum tissues and bone around the roots healthy. 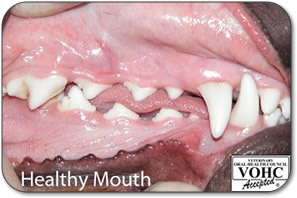 VOHC recommends periodic veterinary examination of the mouth and teeth of your dog or cat. Many pets, particularly middle-aged and older cats and dogs, require periodic professional scaling in addition to on-going plaque control.